Made from Nigella’s “Grandma’s Devil’s Food Cake” recipe* with the addition of fresh cream to sandwich the layers together and chocolate curls to decorate, this is not for the dieter or indeed the faint hearted. It was decidedly delicious though. Usually the spoils of my baking marathons are brought to college to be shared out amongst the ladies in my office and the members of my team who aren’t in my office. It’s become such a common occurrence these days that long protracted explanations or invitations are no longer necessary. Three words will do it. I simply have to ask them…..Cake, or death? And they know there are baked goodies to be had (first come, first served of course). Thank you Mr Izzard for that immortal line. Aside from making chocolately cakey goodness I’ve spent most the of Bank Holiday weekend being Harry Potter to Grace’s Hermione Granger (Egg being designated the role of Ron Weasley). Yes, it’s happened. She has finally discovered Harry Potter (not that I’m complaining!). With our impending holiday travels coming up on Friday (2-3 hours in the car with “are we nearly there yet?” *shudder*) we decided we would try some audio books to see if they could help keep the kids quiet for the journey. We trooped off to the library after Ballet/Tap class on Saturday where we found a copy of Harry Potter and the Philospher’s Stone (read by Stephen Fry – brilliant! I love Stephen Fry). Grace was completely engrossed on our Saturday travels (more on that in another post because I forgot to upload the pics to flickr) and we made it through 3 of the 7 CDs already. When we arrived home we decided to try her with the movies (she hasn’t shown much interest before) and she was totally engrossed in those too (although I wasn’t too sure about the third one, heck, the Dementors scare me! But she had moved on to Playhouse Disney on the computer by that point). You can always tell when something has struck a chord with Grace as you get the “can we play ___________” for weeks afterwards! So, for the moment I’m happy to by Harry to her Hermione. Lord Voldemort doesn’t stand a chance! 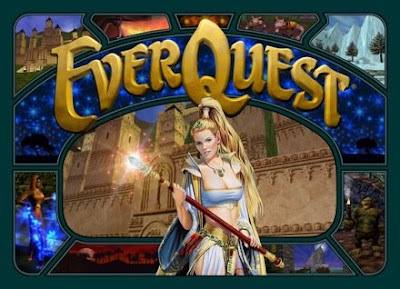 We used to play Everquest regularly. Way, way back, in a time before small people, when we could eat drink and be merry on a Friday evening until the wee hours of Saturday morning, without worrying about having to get up to see to the kids. I drifted away from MMPORG playing when we had the kids and I haven’t played any for ages so it was actually quite nice to have another bash. My account still exists so I have all the characters I used to play on there and it was good fun to discover some of our old ingame haunts. I am such a nerd! LOL. Well clearly what I really need in my life is another form of time suckage. Right? My usual form of time suckage i.e. all things paper and fabric crafty has been sadly lacking of late. I think it might have something to do with the fact that my craft room has done that thing where you don’t use it for a little while and it then becomes a dumping ground for all things that don’t have a home elsewhere. Then you can’t get in there to craft because you’d have to move everything before you start, so you don’t, so the stuff in there breeds more stuff and on and on. Unfortunately that translates into me having to have a big tidy up in there before I manage to actually accomplish anything. Which probably isn’t going to happen at least until after our jollies *sigh* Ah well. At least I’ll have lots of holiday photos to scrap when I get home. *I noticed there’s an error in this recipe. The baking soda, bi-carb, salt and vanilla measurements are in tablespoons here (tbsp) but should be teaspoons (tsp). Cake or death? With that cake there is no contest - it looks fantastic, any left please? When Postie Brings Nice Things.